Are you ready to expand your impact beyond the pharmacy workplace? APhA offers a variety of opportunities for you, as an APhA member, to make a difference in your profession, expand your professional network, strengthen your leadership skills and build your resume. Our volunteer positions range from short-term project commitments to longer term committee work or serving on the APhA Board of Trustees. Read more about our ongoing volunteer positions below. Then complete the volunteer application for the positions of interest to you-please note you will be required to set up an account via our online platform by creating a unique username and password. Help us to advance the profession while advancing your career! APhA is seeking volunteers to serve as mentors for our newest member benefit Mentor360: Practice Collaboratives. APhA’s group-based mentor program focuses on bringing pharmacists together to fuel innovation and progress toward advancing pharmacy practice. Practice Collaboratives bring together a 2-4 person panel of experts on a defined topic area to serve as mentors to a small cohort of pharmacists (10-20 people) interested in learning and refining their pharmacy practice in the given topic area. Interactions between the cohort and experts will occur virtually via webinars and a closed community on the Engage platform where mentors can share their tips for advancing practice and pharmacist participants can ask questions to help break down barriers to their successful implementation. A Practice Collaborative will form to focus on defined components of precepting. Please complete the interest form if you would like to participate in this offering as either a mentor or mentee. Visit www.pharmacist.com/Mentor360 for additional information. The APhA House of Delegates thrives on member involvement. There are a number of opportunities that exists for you to serve your profession on a House Committee. Volunteer opportunities are open to anyone who is wants to be part of the 2017-2018 policy development process. I encourage you to complete the committee volunteer interest form. Please note the deadline for the 2018 APhA House of Delegates Committees has passed but you may submit for 2019. The APhA New Practitioner Network is proud to offer New Practitioners the opportunity to give back to their communities, enhance their communication skills, and promote pharmacist-provided patient care services. Learn more and volunteer today! APhA-APPM's 9 Special Interest Groups (SIGs) are recruiting committee members and chairs to serve during the 2018-19 Academy year (beginning just after APhA2018)! If you are an APhA-APPM member interested in becoming more involved in APhA, serving on a SIG committee is a great step in that direction. 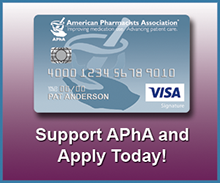 Explore the focus of each of the SIGs at www.pharmacist.com/appm. Please select the SIG from the list below to apply to be a member or Chair of one of the 2018-19 SIG committees. Each form includes a description of the 2018-19 committees purpose/charges. The APhA HOD Committee on Nominations is seeking applications for the office of Speaker-elect for the APhA House of Delegates. The Speaker-elect will be elected and installed during the 2018 Annual Meeting and will complete a three-year term through the 2021 Annual Meeting. The elected individual will serve the first year as Speaker-elect and will serve the remaining two years as Speaker and APhA Trustee. Review the application for eligibility criteria/qualifications, desired characteristics for the nominees, responsibilities and duties, expected time commitments, submission requirements, and pertinent dates. Learn more and apply by March 15, 2018, 3:00 pm (ET)! Nominees for the BPS Compounded Sterile Preparations Pharmacy Specialty Council must be active, licensed pharmacists, and have an active compounding pharmacy practice. BPS board certification in another specialty area is preferred, but not required. The term for this call begins June 1, 2018 and continues for a duration of up to four years. Two members of the Specialty Council will serve terms through December 31, 2019. Nominations close April 16, 2018. For more information, visit the BPS website. Contact Monica Ostrander, Associate Director, Practice Programs and Operations, at mostrander@aphanet.org.